We turn left, past the Royal Tombs at the centre of Nuku'alofa, into the southwestern part of the city, then turn again down a narrow unpaved road. The speed limit in Nuku'alofa and many other parts of Tonga is forty kilometres an hour, but on roads like this one motorists must travel even more slowly, as their vehicles stutter over potholes the size of large kava bowls. We are less than five minutes' drive from the famous kauri timber tower of the Royal Palace, and from the streets of expensive houses - old colonial villas renovated and rented out to Western diplomats, and the ugly concrete piles of cashed-up nobles - which adjoin the palace, but the homes that line this road are squat wooden things that mould has painted grey and dull green. An unskinned pig turns on a frontyard spit, and the smell of charcoal blows through the air, along with the sounds of a flute and a violin. When we reach the end of the road, we find several marquees sitting on a piece of rough turf, in front of an ungainly two-storey building. In the shade of one of the marquees, a group of mostly palangi men and women sit in the darkly flowing robes and elaborate hats that make academics look a little silly at the best of times, and especially silly in the middle of a hot day on a tropical island. Under another marquee, two young Tongan women are singing in impossibly high-pitched Italian voices, to the accompaniment of the instruments we first heard earlier. The largest of the marquees holds sixty or seventy Tongan observers - grandmothers wearing necklaces made of chocolate bars, fathers in dark suits, mothers in dark dresses, dabbing their brows with tiny handkerchiefs, and clusters of little girls and boys conversing in giggles and whispers. Nearly everyone has donned a ta'ovala, the mat Tongans wrap around their waists on formal occasions. We have arrived at the 2010 graduation ceremony of the 'Atenisi Institute, Tonga's oldest, most influential, and most controversial university. As the singers and musicians take their seats, one of 'Atenisi's most distinguished graduates, Dr 'Opeti Taliai, steps forward to address the graduands, their families, and 'Atenisi's staff. Taliai gained his first tertiary qualifications at this tiny campus, and later acquired a PhD in Anthropology from New Zealand's Massey University. After teaching overseas for years, Taliai has returned to 'Atenisi to take charge of the institution's Pacific Studies Programme. Taliai announces that he has "thought carefully" about how to make his address. He says that he "cannot begin" without "paying tribute" to his "first professor" and "intellectual light", but when he tries to name this teacher his voice breaks, and tears fill his eyes. 'Atenisi's simple PA system seems to echo Taliai's distress: the microphone crackles, and the amplifiers on the hot turf suddenly sound like they are filled with crickets. As I wait for Taliai to continue his address, I notice that many other people here - academics in their uncomfortable costumes, graduands, the mothers and fathers of graduands - are also wiping their eyes, and coughing, and trying to compose themselves. The death last February of Futa Helu, the founder and long-time Director of 'Atenisi, continues to sadden Tongans who have studied at this unique and frequently fragile institution. Born in 1934, Helu was one of a generation of young Tongans sent to foreign universities by Crown Prince Tupou IV, who wanted to use them to modernise his country's economy and Tonganise its civil service. Helu studied a range of subjects at the University of Sydney in the second half of the '50s, and eventually fell under the influence of John Anderson, the Scottish-Australian philosopher and political provocateur. A Trotskyist in his youth, Anderson migrated to the political right in the postwar period, but he never abandoned his contrarian love of controversy and his opposition to superstitious and repressive strains in Australian culture. In place of the religious orthodoxies and narrow-winded nationalism he delighted in attacking in his seminars, public lectures and newspaper articles, Anderson advocated a faith in reason and science. Anderson was a philosophical as well as a political controversialist: he rejected the work of virtually all modern philosophers, and championed instead the notoriously obscure pre-Socratic thinker Heraclitus. When Futa Helu made his long-awaited return from Sydney to Tonga, both his relatives and Tupou IV expected the talented young man to accept one of the more senior jobs in the Kingdom's civil service. But Helu refused to take a government job after his return to his homeland. 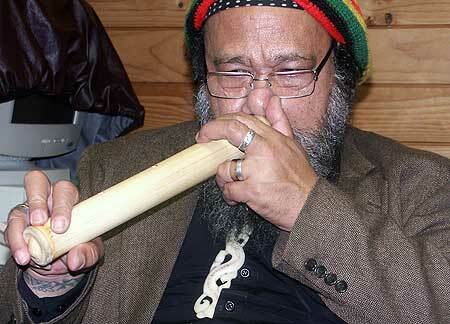 Instead of mixing with Tonga's elite, he formed a kava circle which met in an unglamorous part of Nuku'alofa. Intrigued by Helu's behaviour, and keen to find out what the young scholar had learned abroad, many Tongans paid visits to the new kava circle. They soon found that discussions over kava with Helu differed from the gossip, politicking, and joking that passed for discourse at many other kava circles around the Kingdom. Helu's kava sessions were an attempt to recreate the spirit of both John Anderson's university seminars and the Socratic dialogues of the ancient Greek philosophers. Without being either pretentious or glib, Helu would introduce his fellow drinkers to exotic subjects like Greek tragedy, or dialectics, or Freudian psychology, and then challenge his interlocutors to relate these subjects to Tongan culture and history. In a small, isolated and conservative society like postwar Tonga, Helu's exercises in free thinking were something of a sensation. Soon his kava circle was crowded with guests, and he was being asked to tutor his fellow Tongans in a range of subjects. Helu's renown as a pedagogist made it possible for him to found the 'Atenisi Institute in 1966. Along with a group of prospective students, the philosopher acquired sixteen hectares of swampy land on the western fringes of Tonga's capital, travelled to the forested island of 'Eua, felled a few tall trees, and then raised a series of classrooms and lecture halls. 'Atenisi at first focused on educating Tongans in subjects like English and maths, but in the early 1970s Helu began to experiment with the first-ever Tongan Studies programme. Tongan song, poetry, dance, and material culture was soon being taught by Helu and his small staff, in spite of the fact that almost all Tongan public schools considered such subjects incompatible with 'serious' education. By 1977, 'Atenisi was offering some university papers, under an arrangement which allowed its most successful students to finish their degrees at Sydney University or the University of Auckland. 'Atenisi began to attract teachers from overseas universities, who accepted massive salary cuts in return for the opportunity to experience life at the institute. In the 1980s and '90s, a generation of 'Atenisi graduates gained Masters degress and Doctorates at Australian and New Zealand universities, and a number of them became notable intellectual figures in those countries. A performing arts troupe based at 'Atenisi toured the world. 'Atenisi's political significance came to rival its intellectual importance. Helu had learnt to distrust both religious and political authoritarianism from his mentor Anderson, and it was not long before he became a critic of Tonga's monarchy and its clerical establishment. He denounced the influence of the Free Wesleyan Church on Tongan schools, and criticised the tendency of some Tongans to accept automatically the decisions of their monarch. In the 1980s and early '90s, 'Atenisi hosted a series of seminars designed to promote Tonga's fledgling pro-democracy movement. In 1992, Helu presented a set of proposals for democratic reform at a major conference at 'Atenisi; in response, the increasingly kleptocratic and authoritarian Tupou IV announced that no graduates of the institute would be allowed to work in the public sector (this spiteful and damaging prohibition would persist until Tupou IV's death in 2006). In the mid-'90s, Helu and the now-famous pro-democracy activist 'Akilisi Pohiva helped organise the Tongan Growers' Federation, which represented small farmers producing crops for export, and then guided that organisation into an alliance with the Tongan trade union movement. 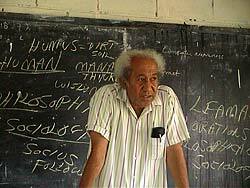 Helu's duties as a teacher and an activist did not prevent him from producing a considerable amount of scholarly writing between the 1960s and the early years of this century. As an intellectual pioneer working in an isolated society, Helu felt obliged to consider an intimidating range of subjects, from philosophy to sociology to literature to psychology to educational theory. In the collection of Helu's academic papers, essays, and lectures issued at the end of the '90s by the Journal of Pacific History, a densely sociological consideration of 'Identity and Change in Tongan Society Since Cultural Contact' rubs shoulders with a careful study of 'The Thinking of a Psychotic' and a frankly celebratory paper on 'Laumatanga, Pride of Locality, in Tongan Poetry'. Helu's idiosyncratic worldview gives a unity to his diverse writings. He was an internationalist, who believed that cultures separated by space or time, or by both, could enrich each other, if only they were allowed to enter into respectful dialogue. Helu honoured Polynesian culture, and was acknowledged as an authority on Tongan song, poetry, dance, tapa, and genealogy, but he believed that the tradition of rational enquiry and argument he identified with the ancient Greeks needed to be imported into the Pacific. 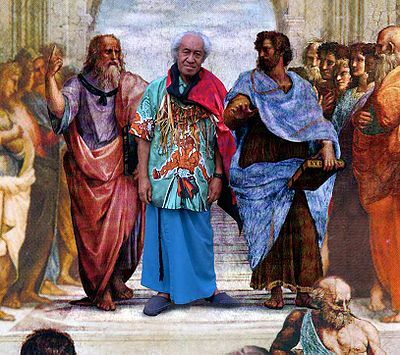 By giving his school the Tongan name for Athens, Helu expressed his desire for a dialogue between European and Polynesian intellectual traditions. Helu was an inveterate critic of the late twentieth century intellectual fashions of postmodernism and cultural relativism. He accused postmodernists, with their scepticism about 'grand narratives' of history and notions of truth, of being enemies of reason, and he believed that cultural relativism, with its claim that different cultures were intellectually and morally incommensurable, is an insult to indigenous peoples like the Tongans, who have shown themselves quite capable of interpreting and adapting Western ideas and practices. But if Helu rejected fashionable postmodernists like Derrida and Foucault, he was also scornful of thinkers who promoted overly narrow conceptions of reason and science. Like his old teacher at Sydney University, Helu rejected the attempts of logical positivist philosophers and positivist social scientists to reduce the complexity of human life to 'verifiable propositions' and tables of statistics. 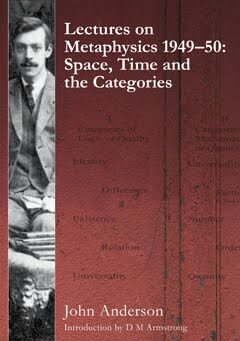 Helu believed that the sciences included subjects like sociology and psychology as well as physics, and that the proper exercise of 'reason' depended on the sort of improvised, partially subjective judgments common to aesthetics and ethics, as well as on the calculative thinking of mathematicians and physicists. Helu's enthusiasm for Heraclitus lies behind all of his thought. Like John Anderson, he saw the inventor of dialectics not as an isolated, somewhat eccentric thinker but as the unacknowledged father of many of the most radical and important ideas to emerge in the West. In the book he published on Heraclitus under the 'Atenisi imprint in 1996, Helu claims that the philosopher's emphasis on contradiction and change - an emphasis summed up in his famous maxim that 'one does not step twice into the same river' - makes him the father of intellectual projects as apparently different as Einsteinian physics and Freudian psychology. Helu believed that Heraclitus' recognition of the complexity and fluidity of reality was more important than ever, in the globalised, frequently chaotic world of modernity. Helu's interpretation of Heraclitus represents a slap in the face for Martin Heidegger, who famously tried to enlist Heraclitus in his battle against modernity and science, and also contradicts the cautious approach to Heraclitus taken by most Greek philologists, who tend to emphasise how fragmentary the textual remains of the philosopher are, and how little we know about the details of his thought. Helu's reading of Heraclitus might resonate, though, with Marxist thinkers, who have, from Marx onwards, tended to honour the ancient Greek as the founder of their dialectical method of investigating the way human societies develop and change. Did Helu perhaps acquire his interpretaion of Heraclitus from the Marxist tradition, via John Anderson? Could a subterranean Marxist current run through the thought of the leading intellectual of this fiercely anti-Marxist nation? Some of Helu's most distinguished students have carried on his intellectual project. Commentators sometimes talk of a 'second generation' of 'Atenisi scholars, many of whom live and work in Western nations like New Zealand. 'Okusitino Mahina, who taught for many years at the University of Auckland, is perhaps the best-known member of this 'generation'. Like Helu, Mahina is a wide-ranging and very ambitious thinker: he writes poems, polemics about the state of Tongan society, interpretations of Tongan oral history, and treatises on the Tongan language. Where Helu wanted to fuse aspects of European and Tongan culture, Mahina seems, in some of his work, to want to use Tongan intellectual resources to reinterpret the history of European thought. In the PhD thesis he produced at the Australian National University, Mahina argues that the stories Tongans have used to record their long history possess an implicit 'philosophy' - that is, an epistemology and a method - which can be recovered, made explicit, and used as a perspective from which to interrogate and, if necessary, to criticise the ideas of the great philosophers of the West. In the anthology of Tongan Proverbs he produced earlier this decade for a New Zealand publisher, Mahina again presents his country's vernacular traditions as a vast intellectual storehouse. It is hardly surprising that the death of Futa Helu should shake 'Opeti Taliai and the rest of the 'Atenisi community. But Helu's death is only one of several misfortunes to befall 'Atenisi in recent years. Competition from the Suva-based University of the South Pacific, which has far greater resources and offers its students a curriculum much more focused on economic advancement, has robbed 'Atenisi of some potential students. Even more seriously, officials from Tonga's Ministry of Education have been threatening to remove 'Atenisi's university accreditation, and thus the ability of its ablest students to finish their degrees in Australia and New Zealand. 'Atenisi's small size, meagre resources, relaxed, Socratic methods of teaching, and lack of interest in pleasing the private sector all help make the university a target for intolerant bureaucrats. Like the teachers of New Zealand, who are fighting the imposition of incoherently philistine 'National Standards' at their schools, and the students of Britain, who have been taking to the streets in their tens of thousands to protest huge fee hikes, the 'Atenisi community has found itself at variance with a global tendency towards the homogenisation and corporatisation of education. The crisis at 'Atenisi is easy to observe. Parts of the campus have begun to resemble the classical ruins of Futa Helu's beloved Greece. One building has lost its roof and most of its walls, others have lost the glass from their windows, and the series of ornamental ponds Helu and his staff created are weedy and stagnant. I am told that this graduation ceremony is the first for three years, and that it is only a third of the size of some previous events. After wiping his eyes and clearing his throat, 'Opeti Taliai relaunches the address he has prepared for the ceremony. He praises Futa Helu's "self-sacrifice in the name of 'Atenisi", and notes the "charisma" which enabled the late leader to "attract many international scholars" to these few swampy hectares on the outskirts of Tonga's scruffy capital. Admitting that "some say Futa's methods breed economically impoverished scholars", Taliai attacks the direction of education in Tonga, claiming that other institutions reject the "internationalism" of 'Atenisi, and instead cater to local political and religious interests. Taliai's complaints are amplified by Marilyn Dudley-Rowley, who is Visiting Professor of Social Science at 'Atenisi. In a speech which ranges from Tonga to the Middle East to her home in the United States, Dudley-Rowley attacks the influence of the "religious right" on the contemporary world. She remembers an essay on education Futa Helu wrote in 1990 to warn about the effects that religious fundamentalisms and 'free market' economic fundamentalism could have in a post-Cold War era. Dudley-Rowley believes that, in the age of the 'War on Terror' and out-of-control financial sectors, Helu's warning has been borne out. Dudley-Rowley reveals that she served as an advisor to the 'humanitarian' arm of the United States-led 'reconstruction' effort in Afghanistan, but left her post after encountering "more war profiteering than peacekeeping" there. She sees 'Atenisi as a "bulwark" of critical thinking and civil liberties in a "unique corner" of a world threatened by unconstrained capitalism and imperialist military adventures. Dudley-Rowley vows to help "restore 'Atenisi to its former glory", and calls on teachers and students everywhere to "fight for their rights". Dudley-Rowley's words make most of the graduation ceremony speeches I have heard over the years seem dull indeed. Sitting amongst the families of the young men and women waiting to graduate, though, I wonder whether the sociologist's attacks on capitalism and philistinism have really resonated. I can hardly hear parts of her address, as the PA system continues to rebel, and some of the Tongans around me chat and giggle. Are the noble ideas of Futa Helu and his academic supporters doomed to meet with indifference in this strange new era in Tonga, when democracy is a complicated reality rather than a beautiful idea, and when American popular culture is a rather more potent force amongst many of the young than either Greek philosophy or Polynesian poetry? Suddenly, though, the people around me begin to applaud loudly, and cheer, and jump out of their seats. The speeches are over, and the graduates have begun to accept their degrees. After certificates have been handed over and hands have been shaken, Tongan pop music pours out of the speakers, and an extended family hauls an enormous tapa cloth onto the turf between the marquees. The cloth is spread out, and family members - children, muscular teenage boys, podgy Mums and Dads and Uncles and Aunts, and slow-moving grandparents - begin to dance around its great dark fish and elaborate flowers. At the centre of the dancers is a young woman showing more of her body than one would normally expect to see in Tonga; older females spread some sort of oil - is it the sweet-smelling stuff made from sandalwood? - on her legs, and her arms, and her shoulders, and then attach money to the moistened skin. The tapa and the money are presents to 'Atenisi. Family after family repreats the ritual. I have never seen exuberance like this at a graduation ceremony in New Zealand, and I realise that Futa Helu's reverence for education persists, in spite of all difficulties, on these sixteen hectares near the edge of Nuku'alofa. some would say that john anderson passed from trotskyism through anarchism to a more conservative libertarianism...? 'It is 'Okusitino Mahina who initiated me to the fascinating universe of Tongan poetry. I met him in Sydney. One of the most fortunate chance encounters of my life, as I had already decided to go to Auckland in 2005 to study one or more Polynesian languages. Here is an interesting basic glossary of Tongan poetics. I can't use the macron (to designate long vowels) here; instead, I'll capitalize the long vowels. Especially interesting is how "faiva" and "hiva" are related to each other, and how "hiva" develops into "hiva kakala." This lashing is connected with the material arts of house-building and boat-building. I think the dance the young girls perform is called "Tau'olunga". The young female relatives of the graduands started the dance and then her family members joined her, placing money onto her oiled skin - the money raised was then given to the 'Atenisi Institute along with the woven mats and tapa cloth as a sign of gratitude and to raise money for the Institute (which as you know from this post is going through hard times). Auckland Uni, Anthropology Dept, is no friend of Atenisi. Not surprising since the university has been led by market-liberal VCs like John Hood and his protege McCutcheon who turned higher education into an euphemism for higher profits. Okusi Mahina was denied promotion for most of the time he was at Auckland and had many battles to keep his job before being snapped up by Massey a couple of years ago. Dave - we cant evade politics! And I always beleived Universities were and should be havens for deep and interested thought and tolerance and openness to ideas. Knowledge (love of truth and knowledge is in fact philosophy is it not?) for its own sake was the aim as in the peripatetic 'Universities' or schools of Aristotle etc. I still value Universities though. In his values and ideas, Futa Helu was perhaps like a latter day Aristotle or a Heralclitus...a deep and inspired thinker it seems. This is a very informative post by Maps - thanks. Interesting they were influenced by Heraclitus etc Ted Jenner would be very interested in this is Ted looking here? Give him a prod, if not, Maps. I hope Athens - or Atenisi - continues and grows. Not surprised the US woman was disillusioned in Afghanistan...interesting linkages..."democracy" arising perhaps from Athens is now fraught. Is it a good thing (in itself) in fact? (Hitler was voted into power in a democracy.) In fact democracy and its value or not, was one of the big questions always in Ancient Greece. Socrates debated it and was opposed to it (in its then limited form, Plato believed perhaps rightly in "Philosopher kings" and so on))..but Democracy in the mouth of a US President or a "Globaliser" or free market "right winger" sounds like an obscenity. "All things are a-flowing, sage Heraclitus says." Sad to hear about Mahina's treatment at the U of A. Staff, students, and graduates of the University of Sydney have apparently written an open letter calling for the retention of 'Atenisi's university accreditation and of its link with Sydney; I've suggested to some of the 'Atenisi staff that something similar might be done in New Zealand. I agree, Richard, that the story of Futa Helu is an extraordinary one. Somebody ought to make a movie about the man! I'll send Ted the Heraclitean a link to this post. ...and from our correspondent in Tonga...Once again, great stuff, reading your blog is always something of an adventure. I am not surprised that Okusi got short shrift ultimately from UoA, if only for his work habits, as observed by a bemused grad student in the archy stream who never took any of his papers. There would often be a crowd of students in Okusi's office at all hours of the day of night, and reading about his academic heritage at Atenisi this now makes much more sense to me. He was also often working in his office at one or two in the morning when I was going to bed in the grad room or my office and the cleaners were buffing the floors. Those were the days! Okusitino Mahina sounds a little like EP Thompson in his work habits! Thompson would give vast amounts of time to his students and to intellectually important but not strictly academic activities (giving public lectures, for instance, on subjects like nuclear disarmament) and then make up for it by working ungodly hours. Thomspon actually argues, in his great essay 'Time, Work-Discipline and Industrial Capitalism', that the cyclical way in which a lot of students and some academics work, or used to work, is a hangover from pre-capitalist days, when artisans would labour like mad to meet a deadline and then attend to other matters for a week or two before getting back to their core business. He argues that the cyclical work-routine is healthier and more creative than the nine to five routine favoured by most modern capitalist societies. It's depressing to think how many great intellectuals like Thompson would not be tolerated in the corporatised environments of the typical twenty-first century university. Imagine Kendrick Smithyman, who never finished his BA, teaching at Auckland now, or Ludwig Wittgenstein, who never published a thing for twenty years and made up his lectures on the spot, being employed today at Cambridge. I was just saying this morning to Skyler that a new generation of intellectuals seems to be choosing to work outside the university, whilst sometimes using its resources (publishing with uni presses, giving guest lectures, and so on) because they don't fancy the compromises involved with modern-day academic life. Perhaps we're heading back to the period before the Second World War, when some of the most visible left-wing intellectuals - George Orwell, for example - operated outside the universities? Getting back to Tonga: if you're in Auckland at some stage over the coming months I'd love to talk you about some of the stuff I encountered on 'Eua last week. That place deserves to be studied by archaeologists, ethnographers, and linguists: it's a goldmine! The studies that have been done so far (most of them have been done by natural scientists like botanists) have worked in nicely with attempts to get an eco-tourism industry going on the island. Nonsense Maps - with your abilities, contacts and the work you have done on Thompson, Smithyman etc - you would fly into really god job at Auckland Uni - nothing wrong with a good income and position. An important profession. I guarantee Smithyman here today would find a place. (It's not what but who you know; you have to get cynical. Bill Direen is lecturing at Uni). There are many young people there need such as you as an ally. Don't surrender the Uni to the Philistines. It's who you know that counts. Don't buy into all this idealism and bitterness so much. Make your own job. Fight from within! Futa Helu for VC of Auckland University! Would be great if Futa Helu was still alive! Interesting comment there about some of the brightest intellectuals working outside the university system today. Let's face it, today's university is a capitalist business-oriented organisation which would make Plato (of the Academy) and Aristotle (of the Lykeion)weep at the travesty. And yet.. only the aristocrats in Plato's time studied at the Academy, those with leisure time on their hands (schole, Greek for 'leisure time' is the etymon of our word 'school'). Herein lies the basic difference: the Academy and the Lykeion were for young aristocratic men who studied out of an intellectual interest in matters philosophical. The university today is something of a banausic (Aristotle's term) institution for those with money if not leisure time who study for the sake of an occupation in the near future. Poles apart, no? To recreate Plato's Academia, we would need a small group of aristocrats with a lot of time on their hands and intellectual curiosity, a slow pace of life, and slaves, many of them to do the boring and stressful work. The middle class in Athens was small, consisting mainly of bankers and merchants!! Thanks Ted for that fascinating response, which I'll chew over and reply to. Hopefully we'll see you tomorrow! Maps - invite greatly appreciated - what's on tomorrow? You two going to church? Ted is right - much of the "democracy" we imagine happening In Greece is a myth...it was only ever for the few (certainly not the poor or women or slaves or blacks) if it existed at all - and Socrates died for opposing democracy...so like the Yanks these days, at the time he died, they had made something holy out of democracy which is really a load of hokkum - Hitler got into power in a very "advanced" democracy... I'm a little partial to Plato's Philosopher Kings. But then Heraclitus and Hesiod etc have their place...more as poets or dreamers than thinkers - no? Who put the "moc" in? BTW - detail, in your Smithyman book, Smithyman goes past the Hyatt hotel -now it opened not as The Hyatt - but as The Hotel Intercontinental. I remember it well. I had no problem with it but it wasn't the kid of place I would go into. Well, I rarely went into pubs or restaurants in those days in any case...but it seemed tomeabout1969or so just too much out of my range so to speak. But one (Smithyman may have he was always thinking it seems) didn't resent it or think it was 'ugly' it was just there. Agree with you to some extent about democracy in Athens, Richard, yes very limited, restricted to male citizens who could prove that at least one parent was an Athenian. But the problem went deeper - this mob of citizens was often too easily swayed by the speaker who appealed to their basest instincts. (Remind you of someone?) These demagogues lost Athens the war with Sparta because they told the sovereign body (the citizens) the war could be won when they could have made a peace with their enemy on favourable terms. And again you are right, Socrates was executed by a democracy for criticizing it! Worshipping 'strange gods' and 'corrupting the young' were red herrings... The Athenians invented democracy? Maybe but they also invented demagoguery into the bargain. My view of the old director is based on what some staff members told me, and some documents they sent me, but I'm happy to revise it if it's inaccurate. The point of the 'Atenisi piece was really to celebrate Futa Helu, rather than to polemicise about the situation of the institution today. Time to bring together Pacific Islanders and their comrades who have worked outside of the confines of the corporatized, homogenized, commodified institutions of so called higher learning in Australia, New Zealand and "the islands." We could start with the graduates from Tonga's Atenisi. Helu's spirit ought not to be allowed to die. for the faculty institution of higher education. also assist we having data had to reluctantly submit an application for the faculty college. major great quality. we help to you will back in processing these f1 visa for your health in highly a shorter period. overseas education consultants in himayat nagar when it comes to united states of america practice virtually any information about training companies and as a consequence univerisity we then may help you. A belated comment. That Derrida and others who are proscribed as somehow "wrongly" postmodernist, and that they are necessarily "cultural relatavists" is quite wrong. Derrida's technique of deconstruction was in fact a dialectical technique more thorough going than that of Marx's. It seems to me that Marx was in fact arrogant. He pushed his theory of dialectical materialism (from Hegel) and there is insufficient fluidity in his thinking. Heraclitus yes, some good ideas from him. But his work IS fragmented. If you want a relatavist, then you have one possibly in Protagoras who was said to have said "Man is the measure of all things" and also that even if he could know all things he couldn't or wouldn't be able to explain it. I think that Marx's way of operating was responsible almost directly for the failure at all of any truly democratic peoples' government anywhere in the word. The same for Lenin. Mao tse Tung was closer but slowly things slid away after his death towards Capitalism, but he did liberate people - millions and gain more equality for women - and his forces defeated the Japanese. That said, the limitations of Marxism itself are what have hampered the left wing movement. Where postmodernism tends to fail is in fact through its over influence of Marxism: and Marxism's its rejection of oppositional ideas, religion, alternative thought and the subtle ideas of Wittgenstein, Foucault, Derrida, Barthes and others of vital significance everywhere. Derrida enables a WAY of thinking, as indeed we can see (although it is through a dark glass of time) Heraclitus pointing to other ways of thinking. But he doesn't supplant Aristotle and the others. But where did Futa Helu actually state his opposition to Foucault and Derrida? There is no doubt however, that he was an extraordinary man. But I dont see him as a Marxist. Pro democracy and anti-Royalist perhaps, but siding with Heraclitus etc doesn't make him a Marxist. major beneficial quality. f1 visa from your facet is produced in extremely a shorter time. foreign education consultants in hyderabad around america if you ever your info about faculties and also univerisity only then do we will help you. visa consultants in hyderabad for usa We are the Best USA B1 B2 Visa Consulants providing the Best service to all our Cusomters. We analysize the applicants profile and let them know how to apply for the USA B1 B2 Visiting/Tourist/Business visa.